Nico Tomkins – offering guitar lessons in the comfort of your own home & at his home studio, for children, teenagers & adults of all ages & for total beginners, intermediate & advanced professional students. Based in Clapham & Tooting, mobile tuition is offered 7 days a week in rock, pop, jazz, indie, blues, funk & other styles. Lessons usually happen on a weekly basis. Learn on electric, acoustic or classical guitars. Rockschool, Trinity College & Registry of Guitar Tutor grades 1-8 can be covered or follow your own custom-made course. Right & left handers welcome. Nico has a clear DBS check for you to view. Areas covered in South & South West London include Balham, Battersea, Brixton, Clapham, Earlsfield, Furzedown, Herne Hill, Merton, Stockwell, Streatham, Tooting Bec, Tooting Broadway, Tulse Hill, Wandsworth, Wimbledon & West Norwood. Postcodes including SW2, SW4, SW9, SW11, SW12, SW16, SW17, SW18, SW19, SE24, and SE27. Please get in touch to see if your area’s covered. For all ages, levels, styles and guitars. Lessons have a relaxed but focused approach giving you the confidence to progress steadily with materials tailor-made to your own tastes. Beginners the earliest stages of the guitar can be challenging, so clear information & inspiring lessons will help you through. Many of the study areas below are covered at a beginner’s level. At the early stages ‘bad’ habits can be formed, so tuition can be very useful here. If you can commit to around 30 mins daily practice you’ll be amazed at your progress. You may have a friend or a small group you want to study with and adequate space in your home for this. Learning with fellow students allows you to get into playing with other people & can be a great motivating factor. It can also help to spread the cost. Please call 07962 401 017 for further details or use the contact form here. Individual, pairs or small group lessons from age 6 upwards. The lessons are focused & fun & will stimulate your child’s natural musicality. Kids experience a real sense of achievement & heightened confidence through learning guitar. Nico has a clear DBS check dated September 2016 for you to view. Children can take grade exams from 1 to 8, all exam boards & styles covered. Or they can study with custom-designed materials without the exam framework being present. 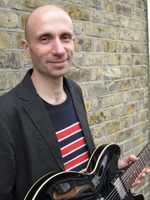 With over 10 years experience of teaching children Nico has transcribed much child-centred music. Think Harry Potter, The Simpsons & many more. Learning guitar will also more generally improve your children’s concentration levels, patience & physical dexterity. Some kids even start teaching their siblings & charging them! After years of dabbling in guitar, picking up bits & pieces randomly, I decided to get some lessons to make sense of it all. The fog started to lift from the first lesson with Nico thanks to his ability to convey his in-depth knowledge of both theory & playing in a practical & easy to understand manner. His calm & relaxed demeanour immediately puts you at ease which facilitates the learning process immensely & along with his warm encouragement gives you the confidence to stretch yourself beyond what you thought you could do. Nico draws the best out of you in such a casual way that it often takes you by surprise, but one thing is for sure – every lesson is thoroughly enjoyable. I can’t recommend him highly enough. Nico is an extremely patient teacher! His teaching method is clear & he is always willing to go through the lessons until they are completely understood. Being an adult learner, this is invaluable. He also has an holistic approach to teaching guitar informing not just on theory & playing the instrument but on good posture as well. I have no hesitation in recommending Nico as a great guitar teacher. We are delighted to have found Nico to teach our daughter, who was six when she started lessons 18 months ago. It’s great that he comes to our home, making it easy for us to fit our lives around the lessons. Nico keeps her interest and enthusiasm going by varying the focus & the home-‘play’ exercises every week, and by responding to her interests & tastes. He has been teaching her how to sight read conventional notation and other kinds of guitar-specific notations, but manages to do this in a way that the learning is never too dry. She has made really good progress & enjoys playing, and looks forward to her lessons. We would thoroughly recommend Nico to anyone seeking guitar lessons for their child. Nico is a very passionate teacher and musician! His influences vary from jazz, to rock to classical so he can teach just about any style. I especially enjoy learning jazz from Nico, as he makes the concepts and theory easy to understand & the lesson always ends up in a little jam session! If you need first-class guitar lessons from a first-class teacher then look no further. Nico has been teaching my 10 year old daughter for 2 years. He’s an excellent teacher, who has a real enthusiasm for his subject. My daughter has made good progress & her confidence has steadily grown. I attribute this to Nico’s calm, patient and supportive manner. 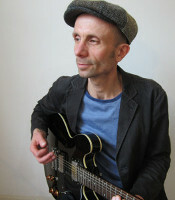 He has an informal, relaxed approach to teaching guitar but at the same time remains completely professional. Nico is creative & varies the lessons to keep her focused & on task. He encourages practice between lessons by regularly setting a selection of ‘homeplay’ tasks, geared towards her musical interests. Nico is an accomplished guitarist but at the same time has a genuine interest in teaching. He is always punctual & completely reliable. I have no hesitation in recommending Nico as a guitar teacher for all ages. Nico has been teaching my 9 year old son Jacob guitar. This has been a perfect start for Jacob. Nico is patient, thoughtful and creative in his approach to teaching. He has also made it a really fun experience. Jacob really looks forward to his guitar lessons and has been making great progress. I would confidently recommend Nico as a guitar teacher and we feel very pleased to have found him. My 9 year old son is enjoying his guitar lessons with Nico very much. The lessons are varied and Nico is encouraging and responds well to my son’s musical interests. It’s also very convenient that he will teach in our home. Nico has 15 years experience as a guitar teacher & has been a professional musician for over 15 years. Currently in the duo ‘Split Lines’ with Nick Ramm (ex-Cinematic Orchestra). Amongst others he’s worked with Eska (Mercury nominee ’15) Marcela Puppini (Puppini Sisters), Parsley Sound & the session musicians Dan Lipman (ex-Bjork) Tom Herbert (The Invisible, Jessie Ware) Oroh Angiama & Jonathan Shorten (Joss Stone). Qualifications Nico has grade 8 in Plectrum Guitar (Trinity-Guildhall), Music A Level, an A grade in ‘Advanced Jazz Guitar Improvisation’ (Berklee College of Music Online) & has a first class honours degree in English Literature from the University of Glasgow. For lessons at Nico’s £35 per hour or in your own home £35 hourly plus the additional travel charge of between £5 & £15 depending on the travel-time to your location. For children £30 for 50 minutes or £35 for 1 hour plus the travel charge if applicable. £24 per hour each (£48 per pair) plus the travel charge if applicable (see above). It works best if you can find your own partner for pairs lessons. With just enough room in your own home, groups of 3 or 4 can be arranged. It works best if you form your own group of guitarists at a similar level. Please give at least 24 hours notice, then no fee will be charged. If this is not received then you will need to please pay the full lesson’s charge. Or please complete the form below. Your contact details will not be shared or sold – we promise!